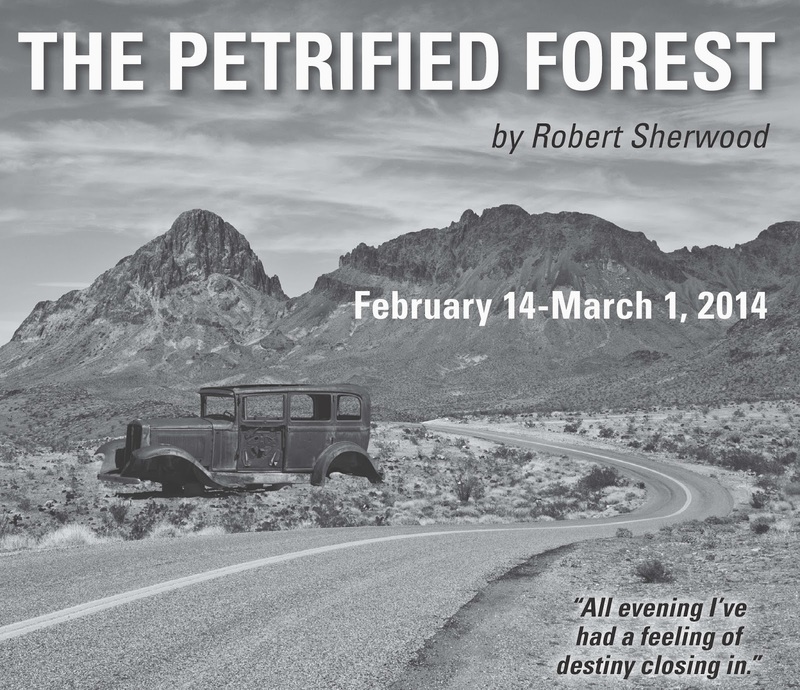 Heat up your winter at Windfall Theatre's production of Robert Sherwood's THE PETRIFIED FOREST a play that is at once funny, romantic, political, violent and ironically resonant today as it was in 1934 when it opened on Broadway and captured the restless mood of the country. It was a huge hit and became a popular film. It tells the tale of hostages held by gangster Duke Mantee in an isolated gas station/diner in the Arizona desert. Their stories revolve around two restless souls: Alan Squier, a drifter searching for meaning to his existence and Gabrielle Maples, the diner's waitress who dreams of escaping to see the world. Robert Sherwood is remembered for his stage plays, movie scripts and film reviews. He is also the winner of four Pulitzer prizes. “The Petrified Forest” and “Abe Lincoln in Illinois” are two of his most famous plays, and “The Best Years of Our Lives” often makes the list of the 100 best films ever made. It is always satisfying to encounter a classic play again, and Windfall is not afraid to take the chance of unearthing a good one. I remember their production of Chekhov’s “Three Sisters” in 2010, proving again that scripts written many years ago still have relevance with human nature being the constant. 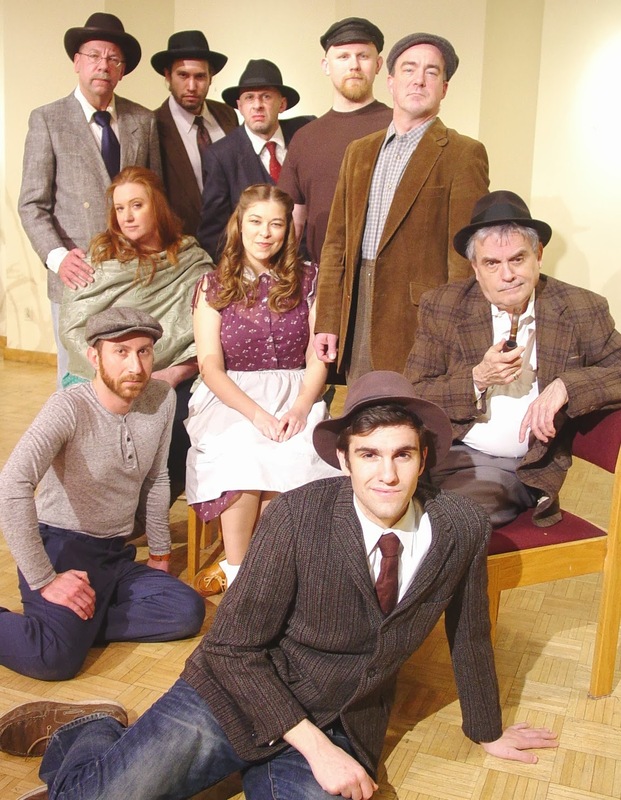 “The Petrified Forest” takes place during the Great Depression in a small café in Arizona. The National Park by the same name is alluded to as a parallel to the lives of all the characters. Their dreams have been aborted, and except for the ending, when there is a glimmer of hope for one of the characters, the mood is dark and the prospects, stagnant. Three generations of family members run the Black Mesa Bar-B-Q Gas Station/Diner in the Arizona desert – Gramps, Jason and Gabby Maple. Gramps wallows in his memories; Jason, in his glory days in WWI and his involvement in the American Legion, and Daughter Gabby in her dreams of going to France to re-unite with her mother and pursue art. Each of these characters is well developed as are several of the patrons who drop in for a beer, a bite and a little comraderie. Boze, a former football star, works in the Café and is in hot pursuit of Gabby, who has bigger dreams. The arrival of another visitor, Alan Squier, changes the dynamic completely. His inglorious failure as a gigolo, a husband and a would-be writer, colors his perception of himself and the world. His allusion to T. S. Eliot’s “Hollow Men” pretty much sums up his dismal philosophy. He is smart, handsome, and disillusioned and depressed. BUT, his conversation with Gabby elicits a few humane sparks in him. The contrast between Boze and Alan is stark and creates some tension and some suspense. A buildup of drama occurs when Duke Mantee (a character modeled after Dillinger) arrives with two of his henchmen and holds all the characters hostage. They have hi-jacked the car of the wealthy Mr. and Mrs. Chisholm, so these two characters and their chauffeur Joseph have also joined the trembling assemblage. Several surprises are in store for us as this encounter proceeds. People’s characters are often revealed in crises, and that is certainly true here. Even Dillinger is seen as a human being, not just a bad guy. Well paced and directed by Carol Zippel, “The Petrified Forest” holds our interest throughout. The standouts in a well chosen cast include Joe Picchetti as the cynical Squier, Amanda J. Hull as the tough-minded but innocent Gabby, Tom Marks as the fearless Gramp Maple, and Robert W. C. Kennedy as the slippery Duke Mantee. Marcee Doherty Elst is memorable in her cameo role when she unearths some of her long-hidden frustrations. This production runs through March 1 with showings on February 21, 22, 24, 27, 28 and March 1. There are no Sunday performances because Windfall’s Theatre is the Village Church at 130 E. Juneau in Milwaukee. Call 414-332-3963 or visit their website at www.windfalltheatre.com If you’ve never attended a performance at Windfall, I recommend that you do if you’re looking for quality theatre in an intimate space at a reasonable price. The fact that they’ve been around since 1992 says a lot in a city where good theatre abounds.